The altimeter transmits a short pulse of microwave radiation with known power toward the surface. The pulse interacts with the rough surface and part of the incident radiation reflects back to the altimeter. This is a straightforward concept but more difficult to understand in all details. 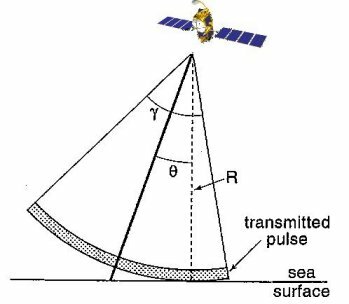 The antenna altimeter emits a spherical microwave radiation with known one or two frequencies (13.575 Ghz for the Ku-band and 3.2 GHz for the S-band of Envisat), toward the surface (water or land) on a nadir direction comprised in a 1.29°-cone (in Ku-band for Envisat). On the basis of this radiation, the altimeter emits pulses, but they are not narrow as with a laser, rather it leaves the antenna as a widening beam, getting wider the further it travels. These pulses are frequency linearly modulated signals and are emitted at regular intervals defined by the Pulse Repetition Frequency (PRF): 1795 Hz for Envisat. In order to reduce the statistical fluctuations and to perform the time tracking, these individual echoes are averaged on-board (typically every 50 ms). The return echo power is recorded in a tracking window (with 64 or 128 gates or waveforms samples) which if it is represented in function of time, gives the echo waveform. The varying power of the return signal, called the “waveform” is sampled and memorised over the reception gate adjusted by the tracking system on board before switching again to emission mode (see A varying bandwidth). To explain the waveform shape we have to detail step by step the reflection sequencing of the wave on the ground surface. First, when the reception mode is activated by the on-board tracking system, a low power noise signal is received corresponding to parasite reflection of the pulse in the ionosphere and atmosphere, in addition to the instrument electronic noise. When the leading edge of the radar pulse hits the ground, the returned signal rises up, the footprint being a disc linearly spreading with time, which makes the corresponding return signal increase up to a maximum corresponding to the passage of the rear edge of the pulse “through” the ground surface. In case of a perfectly flat surface, this rise would be linear. After the rear edge of the pulse passed “through” the ground level, the footprint turns to a ring with increasing radius and constant area. Then the returned signal to the altimeter decreases due mostly to antenna pattern decay and antenna mispointing, till vanishing down to the noise level or being cut by reception gate. Significant return signal is available from reflecting surfaces situated up to 18 km off nadir, which makes the exploitation of altimetric data particularly delicate in case of strong variations of the surface reflectivity. fig 2. The radar altimeter receives the reflected wave (or echo), which varies in intensity over time. 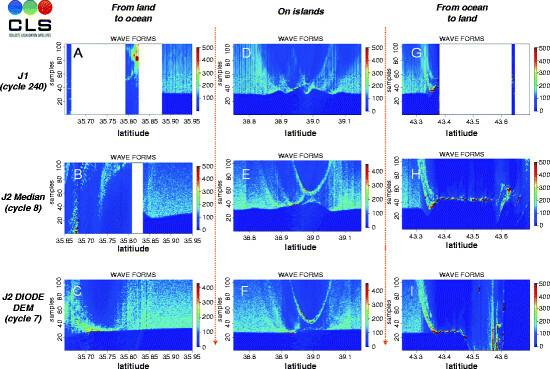 Where the sea surface is flat (a), the reflected wave’s amplitude increases sharply from the moment the leading edge of the radar signal strikes the surface. However, in sea swell or rough seas (b), the wave strikes the crest of one wave and then a series of other crests which cause the reflected wave’s amplitude to increase more gradually. We can derive ocean wave height from the information in this reflected wave since the slope of the curve representing its amplitude over time is proportional to wave height. In order to keep the waveforms well centred in range and power in the analysis window and to better adjust these parameters for the echoes to come, the on-board altimeter calculator makes a brief processing of the radar echoes that the receiver has just recorded. It anticipates the settings for n+1 echoes from the n, n-1, n-2, etc. treatment echoes. When this on-board tracking function is not able to adjust these parameters under critical conditions, the altimeter loses lock. It is in acquisition phase, searching for the signal, locking onto it and stabilizing the tracking loops. This acquisition sequence lasts from 0.6 seconds (for Envisat) to 3 seconds and there’s no data during this, until the tracking is properly reinitialised. 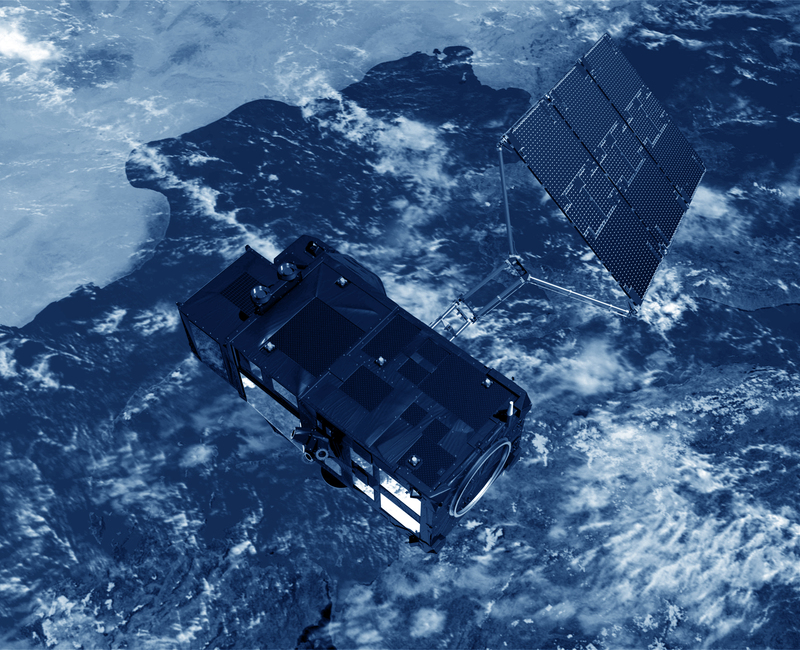 The Poseidon-3 altimeter (Jason-2) is equipped with an open-loop tracking technique for which a Digital Elevation Model (DEM) has been developed. The altimeter’s onboard memory contains the elevation values of areas overlaid by the ground tracks. These data, combined with DORIS data, are used to position the radar echo receiving window in advance, in order to anticipate the contrasts of the topography and to give priority to measurements over water. This technique prevents the altimeter from losing track as sometimes occurs with a conventional tracking loop, and enables measurements to be acquired close to the shoreline or on continental waters. For the RA-2 altimeter (Envisat), an innovative tracking algorithm, known as Model Free Tracker (MFT) concentrates its effort in maintaining the earliest part of radar echoes within the tracking window, independently of its shape. In particular, the MFT will decide whether the range window is using the adequate resolution, whether the resolution could be increased, or decreased, based on the Signal to Noise Ratio (SNR) of the on-board waveform position compared to reference values stored in the on-board memory. When the radar echo is about to move out of the tracking window, due for example to a sudden change in the surface elevation, the window is broadened to recapture the echo. This allows uninterrupted radar operation over all type of surfaces and its boundaries (see A varying bandwidth).